For this product review and giveaway, I'm honored to be partnering with Cathy Brown and Blissful Booty, a company I've long admired in terms of their passion for enabling parents to make good choices for the environment and for their families. Though they now boast a whole lineup of amazing products, Cathy and Blissful Booty began, like so many WAHMs, from simple and humble beginnings. 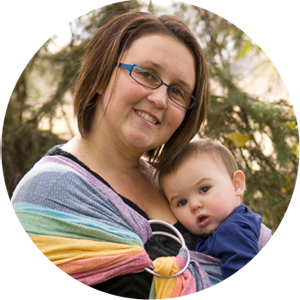 When her youngest daughter, Kaia, was born with health problems in 2005, Cathy began making all-in-one cloth diapers to suit their needs, and soon after, Blissful Booty officially took shape as a company. A mother to four and grandmother to one, Cathy continues to work passionately on the lineup of products she has developed for Blissful Booty. They now carry a variety of diapers, pail liners, wet bags, wipe solutions, cloth wipes, and more! When given the opportunity to share her products with a fresh audience, Cathy generously and enthusiastically sent a whole kit of terrific products my way to share with you all. I was very impressed with the professionalism of the sample kit--the packaging was all very professional, neat, and cute, and best of all, I was able to recycle or reuse every bit of packaging (cardboard went to the curbside, and the sweet, dainty ribbons I kept in my odds and ends drawer for wrapping, etc). In total, Cathy sent me the following items to review for you all: two all-in-one Blissful Booty cloth diapers (in "Buttercream" and "Celery"), two sample sized vials of wipe water concentrate (in "Milk & Honey" and "Sweet Apple Cheeks"), a wipe solution spray bottle, a 10-pack of 100% cotton cloth wipes, and a diaper pail liner! 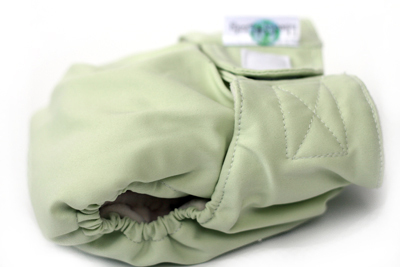 - Soft, waterproof cloth outer cover; No more hot rubber pants! Overall, this is a terrific diaper that fits well, wicks moisture well, remains soft after multiple washes, and holds up well in the wash (also, the lining really is amazingly stain resistant!). 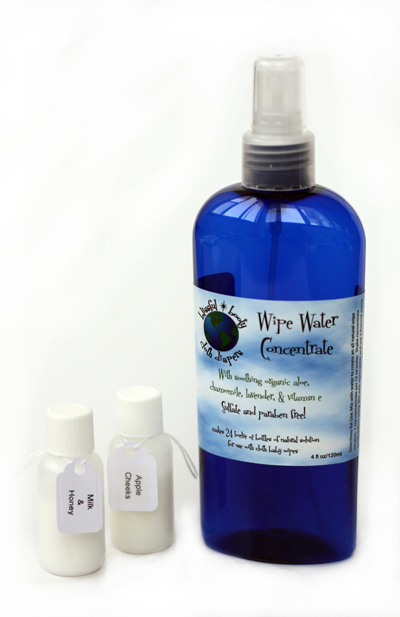 Cathy also sent along with me two sample vials of her Wipe Water Concentrate. This tiny bit of concentrate packs a strong punch, as only 1 tsp is required to add to 12 oz of water. In fact, buying one $25 bottle of concentrate from the Blissful Booty website will create TWENTY FOUR 12 oz bottles of wipes spray for you. I don't know how much spray you go through, but I think that would be enough to last our family a year or more! Although we often just use water and baby wash with our cloth wipes at home, I was excited to try something a little "fancier" (and to, for the first time, use a real spray bottle instead of my old glass BBQ sauce bottle! ;) What I love most about these wipe concentrates is that they are 100% free of all parabans, sulfates, and preservatives. They also have 22 amazing scents to choose from (Sugar Cookie! Just Peachy! Line Dried Fluff!) that all sound nearly drinkable ;) In our 4 oz spray bottle, we added just a dash (about 1/3 of a teaspoon) of concentrate and filled with normal tap water. Give it a shake, and this concentrate is good to go! It is easy to spray and apply to either a wipe or directly to baby's bum--it freshened her up really well, especially after a particularly messy diaper, and left no irritation on her skin (though I did often give a little wipe-down with a plain, water-dampened rag afterwards, as I do with any wipes solution I use). With this spray bottle system being so easy to use, I think that this type of wipes solution would be not only great to use at home, but also great to keep in the car, the diaper bag, etc. It's so handy to just spray and go! I'm sure the bottle would easily store in a wet/dry bag pocket as well! In tandem with the wipe solution, I was very excited to try out Blissful Booty's 10 pack of 100% cotton cloth wipes. I love that their wipes have two different textures to them--one side is a smooth, combed cotton (feels like flannel), and the other side is a rougher surface for stronger wiping capabilities (like very fine terry). 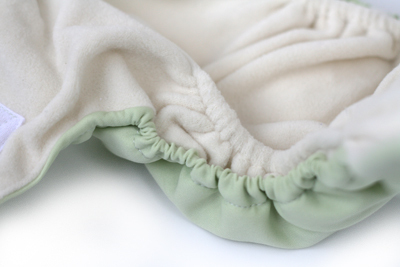 This two-sided approach gave great options for different diaper changing needs (including just a simple pat dry!). I love that they are all-natural cotton but will give you a heads up that I hadn't thought of--with the natural oils in the fabrics, they did have some repelling issues after only 1 wash, so two washes were necessary to get them at a better absorbancy point. So, just a heads up--when you get these, you'll have to fight your case of being impatient, and let them run through the wash twice before you use them, or you'll have water slicking right off of them as I did ;) I was glad to see this, though, as it tells me just how natural and unprocessed the fibres really were, still having their own natural oils in them! A great sign of a true, natural product! I should also mention that, when folded in half, these wipes fit PERFECTLY inside an old disposable wipes container. This makes it very handy to store them or even submerge them in solution or water if you'd prefer. The last, fabulous item that Cathy included in my parcel was the Blissful Booty diaper pail liner. I was very happy to see this as so far I've been using only one pail liner and hanging it to dry over night, then dashing downstairs to fetch it for the morning diaper change! It definitely is handy having two liners now, so that one can dry while there is already a clean one in the pail, ready to go! This diaper pail liner is different than the other (PUL) one I've been using, but I really love it. 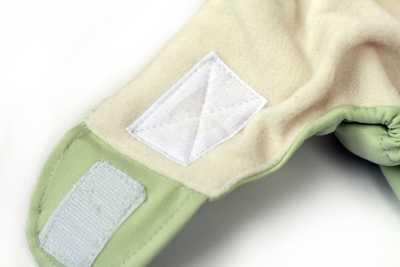 It is made of a soft, washable white nylon (kind of like the fabric in a jogging suit or windbreaker). I find that it has even fewer issues with occasional weeping/wicking than the PUL liner I've been using. It really does a great job of containing even the messiest and wettest diaper loads! 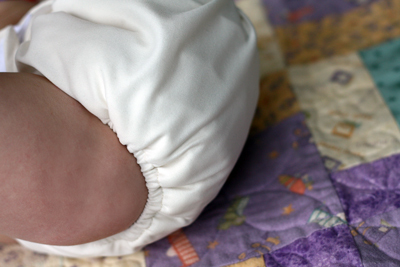 It has never stained, and launders easily with my cloth diaper laundry. It also dries more efficiently and faster (by hanging) than the PUL bag I've been using. So, overall, although very simple in its design and construction, I am a huge fan of this pail liner! With elastic at the top, it easily hugs the rim of your standard-sized diaper pail (I'm using a flip-top kitchen garbage can). 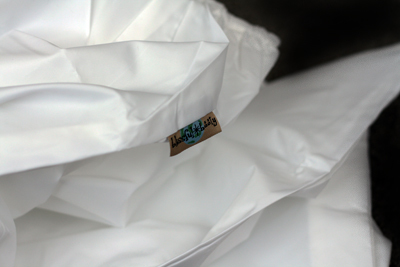 There is also a tiny pouch sewn into the seam where you can place a cotton ball dabbed with essential oil, if you'd like to help keep odors down. Overall, for $12.99, this is a steal, and a great product! Cathy is very excited about sharing some more fluffy love with TWO of my readers, and is planning to give away two terrific prizes: one AIO Blissful Booty cloth diaper AND one of their terrific diaper pail liners! 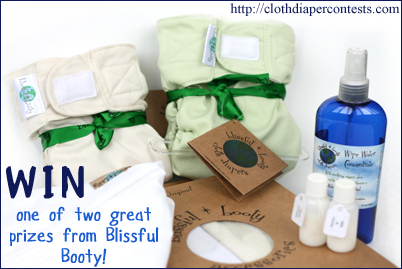 Head over to Blissful Booty right now to buy a terrific new Blissful Booty product for your stash of diapers and accessories! Cathy is offering all our readers a 10% DISCOUNT CODE--just use promo code "BLISS" to see your discount applied at checkout! PRIZE #1: Your choice in color of a Blissful Booty AIO diaper! PRIZE #2: A terrific nylon diaper pail liner! Final details: I received no financial compensation for this review or giveaway, though I did receive the sample items free of charge. All opinions shared are my own, and I was not persuaded to share anything other than my own thoughts. This giveaway will end on April 13, 2011 at 11:59pm MST and is open to residents of Canada and the United States only. Winner will be chosen randomly using random.org’s services. The winner will be contacted by email and will have 48 hours to reply before a new winner is chosen. The prize will be supplied and mailed out to the winner by the sponsor of this giveaway. I would LOVE to try the Melon Patch wipes water concentrate!! I LIKE Blissful Booty on FB! The Sweet Summertime sounds wonderful for hopes of warm weather! I visited Blissful Booty and they also have super cute wetbags that I would love to try. I voted today on Picket Fence. I follow the blog as Amber. I would like to try the sugar cookie scented wipe water. I'd love to try and AIO Ultra...the fact that it has snaps for extra security in addition to the hook and loop? Excellent! I like Cloth diaper contests and giveaways on facebook as Amber dickerson. I like blissful booty on facebook as Amber Dickerson and told them that CD Contests and giveaways sent me. i like Everything cloth on facebook as Amber dickerson. 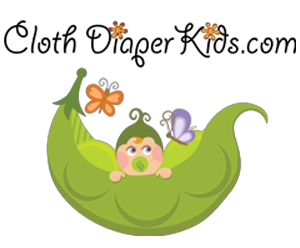 I voted for Cloth Diaper Contests & Giveaways on Picket fence blogs! I follow Everything CLoth via GFC as Amber. Follow @CDcontests on Twitter as scamper1977. Follow @BlissfulBooty on Twitter as scamper1977. Follow @EverythingCloth on Twitter as scamper1977. Follow our blog with the Networked Blogs as Amber. I like BBCD on FB and mentioned that you sent me! I like Blissful Booty Cloth Diapers on Facebook and sent them some love. I subscribed to email updates from the CDC&G blog. I LIKE Cloth Diaper Contests & Giveaways on FB!! I follow CDC&G on FB. Melissa Browning Dekker. I would love to try the coconut wipe water scent. I like Blissful Booty on facebook. I like everything cloth on facebook. I follow Everything Cloth via GFC. I follow CDContests on twitter. I follow everything cloth on twitter. I Follow the Cloth Diaper Contests & Giveaways blog with Google Friend Connect. I would like to try the Melon Patch scent of Wipes Concentrate. 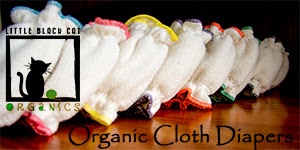 I ‘Like’ Cloth Diaper Contests & Giveaways on Facebook. I 'Like" Blissful Booty Cloth Diapers on Facebook and let them know you sent me. I 'Like’ our partner site, Everything Cloth, on Facebook. I follow Everything Cloth with GFC. I subscribe to email updates. I would like to try the Heavenly Honeysuckle wipe concentrate. I would love to try the Line Dried Fluff wipe concentrate scent. 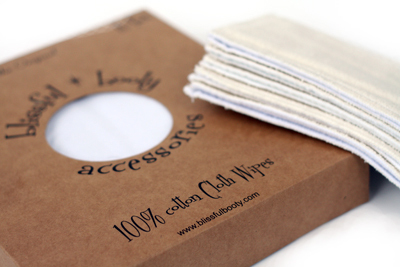 I'd love to try the creamy coconut scent and their cloth wipes!